During treatment for Parkinson’s disease, it is common for seniors to experience times when their medication is not able to effectively control their symptoms. These “off” periods are more likely to occur before the next dose of medication, and seniors may notice decreased ability to control their movements, increased anxiety, and difficulty completing their normal daily routine. As an in-home caregiver, it is important to be aware of these times so that management strategies can be implemented to provide your loved one maximum comfort. 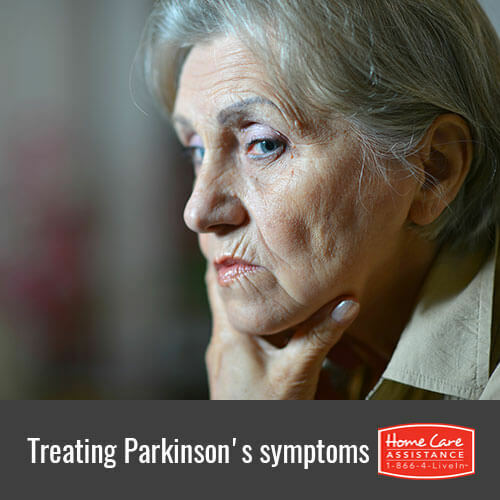 There are a variety of medications that may be prescribed to manage Parkinson’s disease symptoms. Seniors who take medications such as levodopa should be aware that there may be times when the medication is not working as well as it maybe did when first given. Typically, these gaps occur towards the end of one dose, but before the next one can be given. Staying on schedule with dosages can help eliminate or reduce the length of the off periods. During an off period, seniors are at an increased risk of falls, and they may experience negative emotions that can make it challenging to accomplish complex tasks or have conversations. Caregivers can help during this time by making sure the senior is in a safe environment. If he or she is prone to sudden stiffness or freezing, then it may be necessary for him or her to remain in a seated position. It is also important to make sure a senior is never alone during an off period. Having another at-home Parkinson’s caregiver or family member around can reduce anxiety and the chance of injury. Additionally, difficult conversations and major decision-making should be reserved for periods when the medication is working well. As Parkinson’s progresses, it is often necessary to adjust the treatment plan. If off periods are beginning to increase in frequency or duration, then it is important to report this to a senior’s physician. Sometimes, an adjustment to the medication or dosing schedule can improve overall quality of life. Being the primary caregiver for a senior relative with Parkinson’s can be challenging, but you don’t have to do it alone. Home Care Assistance in Rhode Island can help. We are a reliable provider of elderly home care in Rhode Island, ensuring the seniors in our community have all the help needed to remain safe and healthy in the comfort of home. Our experienced caregivers can run errands, provide mobility assistance, cook, clean, help with personal grooming and incontinence, and offer emotional support and companionship. Call a friendly Care Manager today at (401) 284-0979 to learn more.